For an Acoustic Fabric Walls System Proposal, we need the wall area dimensions that you want covered, your fabric choice, 1" or 2" depth, plus the "ship to" address. Acoustic Fabric Wall Systems - The most user friendly, do it yourself, high tension fabric acoustical wall system in the industry. Simply install the track on the walls and ceiling surfaces, staple in the acoustic liner where needed and cover with either our Anchorage, FR701, or AcoustiSuede fabrics. Our track system is hinged and your fabric of choice will easily attach and stretch to the track. It can be opened over and over again to modify amounts of acoustical treatment, or to clean and even change the fabric for easy remodeling in the future. Our fabric walls are a two piece system with a mounting platform. An outer track piece is inserted as shown. This creates a working hinge. This outer track can rotate 90 degrees. In its closed position, the outer track piece has locked. A beveled edge track shows the alignment tape being uncovered. Fabric is positioned, adjusted and trimmed. Fabric is in place, an extra 1.5” of fabric is folded under - 3" total extra fabric for all edges. The outer profile is ready to be snapped closed and locked. 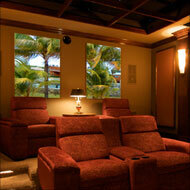 You no longer need to hire an exclusive local contractor to install proprietary stretch fabric wall systems. 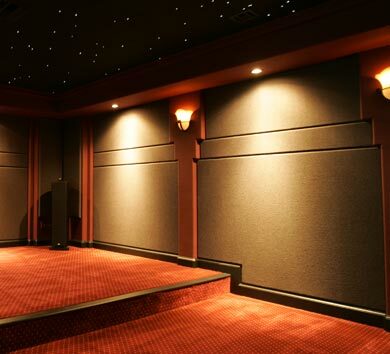 Our unique, user friendly hinged track system allows almost anyone to install a professional looking, high tension, stretchable fabric acoustical wall system with nearly unlimited panel sizes - all at an affordable price. We have the expertise to make it easy! 60" maximum fabric panel width in one direction - virtually unlimited in the other direction. 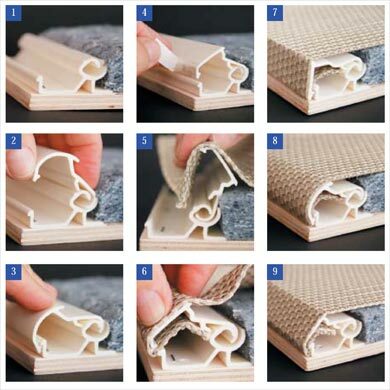 As a part of our optional layout service, we also provide you with a cutting diagram that shows how to cut the fabric for the least amount of waste—making the fabric cutting job easy, saving fabric cost and making the install fast and easy. We have the acoustic design expertise to insure your room will sound great. We have the interior design experience to make your room look fantastic. We take the time and care to get your order right—the first time. Our optional custom layout services make sure there is no installation confusion or miscommunication - installation is a "breeze"!. We charge $75 for 1 wall, $100 for 2, $125 for 3 and $150 to layout all 4 walls. Prices for 1" deep fabric walls range from about $400 to $500 for smaller walls (depending on how much acoustic treatment is required) and $600 to $1,000 for larger walls with many obstacles to work around. For 2" walls, it generally costs in the $450 to $650 range for smaller walls and $750 to $1,200 for large walls with full acoustic liners. As pricing is very specific to your setting (we take into account working around objects such as doors, windows, columns, etc. ), please call us and we can create an exact proposal for your specific fabric wall needs. Additionally, after purchasing from us, we not only email you the complete installation guide, but when you submit your basic room information, we can have our expert designer layout the best acoustic treatment recommendation for your room with a full room tuning diagram for your setting - and even a diagram for cutting your fabric areas. We can also transfer photos to smaller complete panels, or larger portions of your acoustic fabric walls. Put your own favorite artistic photos on the panels, preserve the family photos for all to see, or better yet, transfer the photos of your favorite travel destination so you can go on vacation every night! 1 to 2 business days. Note: Colors will vary from screen to screen, call us for fabric swatch samples for an exact color match - Toll Free 866-243-1001 Monday-Friday 9 am to 5 pm Central Time. Items on this page are custom cut and there are no returns for refund, or exchange. Normally, these products take between 2 days to 2 weeks to ship out. Contact us for specifics.